The Patient Protection and Affordable Care Act is either the greatest piece of social legislation in the history of the United States or it is an abomination inflicted on the American public that will ultimately destroy our health system. 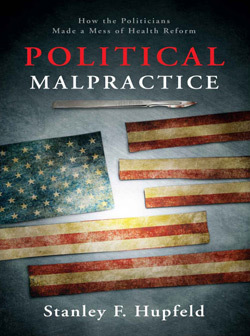 Insider Stanley Hupfeld dissects that health system and exposes the fallacies and prejudices of both political parties.Stanley Hupfeld was President and Chief Executive Officer of INTEGRIS Health from July 1995 until 2010. Stan has spoken and been published widely for his expertise in the health care industry. He currently writes a healthcare column for a local business daily, The Journal Record. As the driving force of the nation’s first hospital-sponsored charter school, Hupfeld was honored in 2009 when the INTEGRIS Health Board of Directors voted to rename the school The Stanley Hupfeld Academy at Western Village. Follow this link for information on my new book. Effective July 1, 1995, Stanley Hupfeld became President and Chief Executive Officer of INTEGRIS Health, an integrated delivery system composed of INTEGRIS Baptist Medical Center, INTEGRIS Southwest Medical Center, and INTEGRIS Rural Health. The System comprises 13 hospitals, all in Oklahoma. Annual net revenues of the System are over $l.3 billion with 1600 beds. Hupfeld was President and Chief Executive Officer of Oklahoma Healthcare Corporation and Baptist Medical Center of Oklahoma from March 1987 to that time. Effective January 1, 2010 he transitioned to Chairman of the INTEGRIS Family of Foundations, and currently is Senior Consultant at INTEGRIS Health. Mr. Hupfeld also served as President of All Saints Healthcare in Fort Worth, Texas from 1977 to 1987. Mr. Hupfeld is a former member of the Board of Directors of the American Hospital Association and has served as Chairman of the AHA’s Regional Policy Board (7). He has served as a Health Care Systems delegate and alternate delegate and Metro section alternate delegate on the Section for Metropolitan Hospitals Governing Council. He has served as Chairman of the Coalition to Project America’s Health Care Board and as fund-raising Co-Chair.He has served as the Campaign Chairman and Chairman of the Board of the United Way in both Fort Worth and Oklahoma City. He serves on the Board of Directors of the Oklahoma City Chamber of Commerce, and has served as Chairman of the Board in 1994; Chairman-Elect in 1993; and Vice Chairman from 1990 through 1992. He is a trustee on numerous other Boards and commissions in Oklahoma. Mr. Hupfeld was a member of the 1963 National Championship Football Team — the University of Texas in Austin. He has spoken and been published widely, and was honored as “CEO Marketer of the Year” by the American Society for Healthcare Planning and Marketing, and as “Executive of the Year” by the Sales & Marketing Executives International. He is the 2003 recipient of the W. Cleveland Rodgers Distinguished Service Award for outstanding service to the health care industry. He was honored in 2007 with one of the American Hospital Association’s highest honors, The Award of Honor, and is also the recipient of the Friends of Nursing Award from the Oklahoma Nurses Association. As the driving force of the nation’s first hospital-sponsored charter school, Hupfeld was honored in 2009 when the INTEGRIS Health Board of Directors voted to rename the school The Stanley Hupfeld Academy at Western Village. He currently writes a healthcare column for a local business daily, The Journal Record. He and his wife Suzie have three married children, and six grandchildren.